I've been lazy. Well, lazy in the blogging since. I haven't really had the time to sit down and blog. The past couple of weeks have been busy in my household. Lady H suffered a small buckle fracture in her left arm and is in a cast for the next couple of weeks. I think the whole ordeal hurt me more than it hurt her, but we are both working through it. So needless to say, my time in my tiny kitchen has been little to none unless it's for a grilled cheese sandwich or a Stouffer's lasagna. I did, however, find the time to make up a really nice salad. 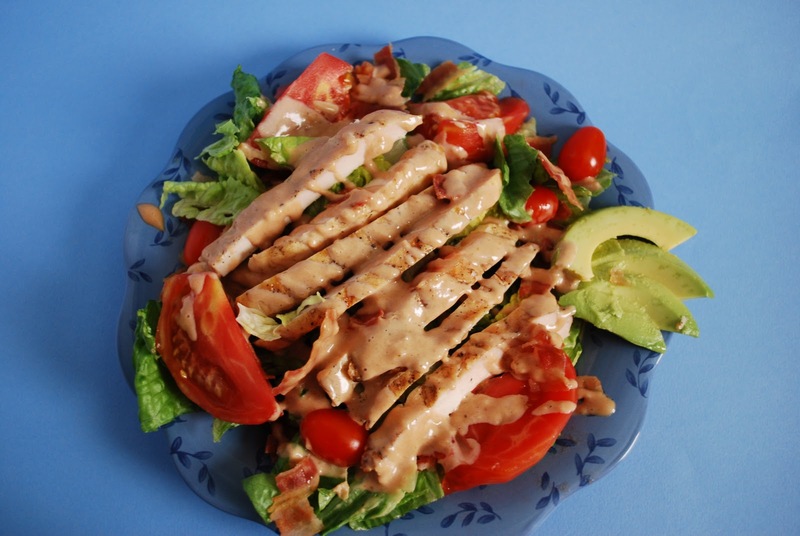 The BBQ based dressing drizzled over grilled chicken and bacon is pretty awesome and filling. A great dish to have for dinner, especially when you don't have the time to spend in a tiny hot kitchen. Combine mayonnaise, barbecue sauce, grated onion, lemon juice and pepper in a small bowl; stir well. Cover and chill dressing mixture thoroughly. Press chopped tomato between several layers of paper towels to remove excess moisture. Arrange lettuce on individual salad plates; top each serving with tomato and chopped cooked chicken. Just before serving, spoon dressing mixture over salads and sprinkle with crumbled bacon. Thank you for posting this; I used to have that recipe collection but don't have it anymore. I could never quite remember the dressings ingredients. It's a great salad!